Anti-Seize Compounds are metallic products that prevent seizure of closely mated parts under high temperature. Like metals mated under high pressure and temperature and long time contact seize, making it difficult to dismantle during service. Anabond Anti seiz compounds provide a dis-similar metal interface and ensures that the parts can be disassembled during service. Typical application includes Exhaust manifold fasteners, high temperature valve threads, heating oven bolts etc. Anabond offers 2 products in this category for 975°C and 1200°C. Anabond C-975 Copper Graphite based anti-seize compound prevents seizure in studs, bolts & nuts due to extreme temperature up to 900 ºC .It eliminates galling and cold welding of threaded assemblies. Prevents seizure of bolts & nuts due to high temperature in turbines, air compressors, boilers, hot forging moulds, exhaust flange bolts in automotive engines, seizing of press fit joints and also prevents corrosion and seizing caused by chemicals and weathering. 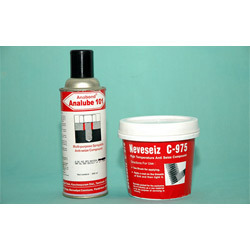 Analube 101 is a anti-seize lubricant which is available in spray form and can be used to prevent seizing & corrosion in press fitted assemblies and fastener. Anabond N-1200 nickel based anti-seize compound prevents seizure in studs, bolts & nuts due to extreme temperature up to 1200 ºC .It eliminates galling and cold welding of threaded assemblies. Prevents seizure of bolts & nuts due to high temperature in turbines, air compressors, boilers, hot forging moulds, exhaust flange bolts in automotive engines, seizing of press fit joints and also prevents corrosion and seizing caused by chemicals and weathering. Prevents seizure in bolts and nuts, studs due to extreme temperature. Used as a lubricant in gears,chains,sprockets, rollers and hinges of machinery equipments. Ensures proper torque, eliminates thread seizure in aluminum and stainless steel bodies. Heavy interference fit sprockets and gears are assembled and pulled easily. 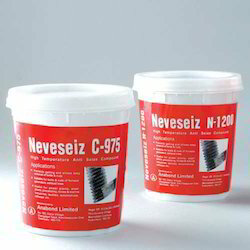 Reduces corrosion and seizing in Fertilizer plants due to strong chemical action and weathering. Looking for Anti-Seize Compounds ?